Riverbed products enabled a human-rights agency to manage the increasing amount of archived data with a limited IT budget. 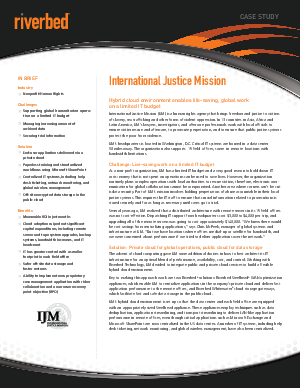 Any money that International Justice Mission's (IJM) IT department can save goes directly toward the organization's mission of rescuing victims of abuse and prosecuting their perpetrators. IJM used Riverbed® Steelhead® appliances to centralize applications such as Microsoft Exchange and SharePoint, in addition to replacing its tape backup system with a Riverbed® Whitewater® cloud storage accelerator and public cloud data storage, avoiding the labor and other costs of the tape system. More importantly, critical data is now more secure. Read this case study and learn more.